Contact the police and have them generate a traffic crash report. Make sure to obtain the car owner or motorist’s name, address, driver’s license number, and license plate number. It is also helpful to note the make, model, and color of the car. Seek appropriate medical attention for any injuries sustained from the bike accident. Often due to adrenaline, nerves, or simply the nature of an injury, cyclists do not immediately realize the severity of an injury. Your health is more important than anything. Accordingly, do not hesitate to utilize emergency medical services or have a friend or family member drive you to the hospital if you have been injured in a crash. Promptly obtain legal advice from an experienced attorney. 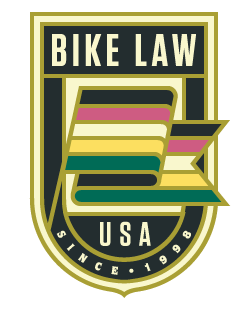 A lawyer with experience litigating bicycle accident cases can usually advise you of important legal rights during an initial call and alert you to issues you need to be aware of in case you are contacted by the motorist’s insurance company. Additionally, in many cases it is important to preserve evidence or have an expert witness begin his/her work before the evidence begins to disappear. For this reason, calling an attorney early can be one of the most important actions you take after a crash. Do not give a statement to the car owner or motorist’s insurance carrier. There is no legal requirement to give a statement. On numerous occasions, we have seen people give the insurance carrier a statement because they were under the impression the adjustor or investigator was “trying to help” them only to see the statement used against the injured person at a later time.